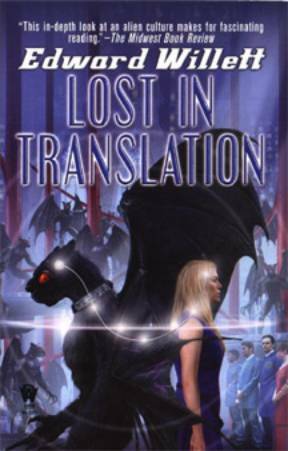 Edward Willett has been publishing non-fiction and award-winning SF for young adults through various small presses for years, but Lost in Translation is his first mass market SF paperback release, so for most readers he will appear as a new author. And a very fine discovery he is! The book opens on the doomed attempts to negotiate a peace treaty with the S’sinn, a species of demon-like aliens who are determined to eliminate humanity, and then quickly flashes back to the experiences of the two children (one S’sinn, one human) who have grown up to become their race’s respective translators at these last chance negotiations. Both translators have been traumatized by the previous war between humans and S’sinn, and can barely tolerate the thought of being on the same stage with the hated enemy, let alone establishing the empathic link that is the basis of inter-species translation. Nevertheless, they manage to rise to the occasion – at which point, things get a lot more complicated. My initial response to the early chapters was that Willett’s depiction of the politics was perhaps a little one-dimensional, his characters a little naïve, but as the book progressed, so did the layers of ethical issues with which the protagonists have to contend, and in the end Willett manages to up the characterization ante, Babylon-5-style. I still retain one or two minor reservations about the deus ex machina happy ending, which I found a bit too tidy to be completely satisfying, but I am pretty sure that is just me. Willett surprised me by writing a ‘first novel’ that was able to both tap into my nostalgia for the hard SF of my youth, and to provide a completely contemporary adult novel. The fast paced action kept me turning pages long after I should have been abed, and the anti-racist, anti-war message seemed particularly timely for the Bush administration’s War on Terror. Willett has long deserved the mass-market distribution he is finally receiving, and Lost in Translation is far better space opera than the right-wing militaristic offerings of established writers like David Weber and Steve White. Suddenly, its worth looking in the ‘W’s again! Also worthy of mention is the cover art by Steve Stone, that — miraculously for a first novel – not only relates to the novel, but actually captures some of the nuances of the story’s tone. Go ahead, judge this book by its cover, because this time, it really does show you what you are getting. Originally in Neo-opsis # 11.